A human story behind the headlines, Professor Tom Honeyands is seeking to put science behind the mining downturn. The sun may be setting on the west's golden iron age, but Professor Tom Honeyands maintains there's no need to panic – if the industry can work smarter, not harder. Indeed, while Australia is uniquely vulnerable to China's economic crisis, it's also uniquely placed to compete for the attention of its struggling steel producers. "The quality of iron ore and the knowledge to use it efficiently has really come to the fore," he asserts. "The countries that do this best will do much better in the current circumstances." Though sparking a wrestling match between mining's heavyweights and policy makers, and just about everyone else, Tom concedes the commodities slump dually allows scientists to be at the coalface of cost minimisation and value-adding efforts. A metallurgical specialist with more than 26 years' experience in consulting, research and process engineering, he is aiming to boost the viability and productivity of our nation's careworn minerals sector. "I look specifically at the use of iron ores in ironmaking," the New Zealand native explains. "The goal is to cement an understanding of its properties and how they behave in different processes, such as sintering and blast furnace ironmaking." Tom's research career began in 1991, when he undertook a PhD at the University of Newcastle. Building a full-scale model of steel caster using perspex and water, he used the three-year probe to examine the fluid mechanics of thin slab caster moulds. "With this type of casting, the same volume of fluid goes into a much smaller area, which causes oscillating waves to form on the surface of the caster," the chemical expert elaborates. "I discovered you can use electromagnetic breaking to stop them from happening, however." "I relied on computational fluid dynamics to explore the magnetic forces at play." Signing on to become a Research Engineer at the then BHP Central Research Laboratory after receiving his award in 1994, Tom sought to expand his knowledge of these and other ironmaking processes. "My most memorable and challenging task was probably at Port Hedland in Western Australia," he muses. "I was part of the technical team working to improve the operability of the Boodarie Iron, hot briquetted iron plant." "I led an investigation into the sintering of hot, partially reduced iron ore as it flowed between fluidised bed reactors." "We had access to specialist laboratory equipment that simulated the high-temperature, high pressure process," he comments. "Cooling the first reactor was found to be beneficial – dense shells of metallic iron were no longer formed on the iron, which allowed reduction to proceed and made the ore less sticky." "This discovery led to the creation of a patented test methodology for the sticking of particulate solids." "It was subsequently licensed to POSCO, a South Korean steelmaking giant." In September 2006, Tom became the Director of Creative Process Innovation, a small, highly specialised consultancy business based in the Hunter. Concentrating on research project management and technical marketing, the accomplished academic looked to foster industry growth both locally and overseas. "I also developed Marx' Value in Use (VIU), which is a mathematical model of smelting and sintering processes that quantifies the value, or lack of value, of iron ore," he adds. Teaming up with the University of Newcastle, Auckland University, the CSIRO and the "who's who" of major global mining companies in 2012, Tom endeavoured to advance the science and engineering that underpins measurement of the transportable moisture limit (TML) for iron ore fines through the AMIRA P1097 project. A ship's rocking motion can potentially lead to bulk cargoes behaving like a liquid, compromising vessel safety. The P1097 project selected and modified a TML test specifically calibrated to iron ore fines shipment, contributing to the new International Maritime Organisation schedule for iron ore fines as well as a draft international standard. Tom joined the University of Newcastle in October 2015, opting to take on leadership roles at its Centre for Ironmaking Materials Research (CIMR) and the "properties and end use stream" of its ARC Research Hub for Advanced Technologies for Australian Iron Ore. Using small-scale laboratory furnaces and microscopy techniques, he's seeking to mimic and better understand sintering and ironmaking processes. "We're currently simulating smelting in a real blast furnace at small scale. The critical part is the soft melting zone, which controls the productivity of the whole process," Tom shares. 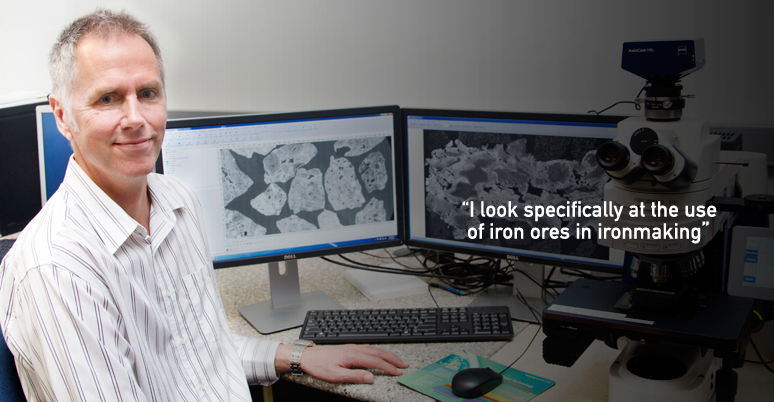 "We're studying the interactions that occur when you charge lump iron ore in with the sinter and pellets." "The primary goal is to help customers get the best out of these products." In the former area, however, Tom is mostly interested in structural changes. "The structure of the iron ore bed changes quite dramatically during the sintering process, and in so doing, determines the quality of the sinter and its performance in the blast furnace." Funded by BHP Billiton and the ARC, Tom is set to run an interstate study on these complex changes in early 2016. "We'll be using the Synchrotron in Melbourne to do x-ray CT scans and build up a 3D picture of the structure – how strong it will be and how easily it will reduce," he clarifies. "We'll also be using sinter pot experiments, which are pilot-scale simulation devices housed in the CSIRO in Queensland and Zhejiang University in China."